Crystal Harrington continues to learn many valuable career skills in arguably the busiest pediatric dentist practice in Fort Myers. As most senior in her position, Crystal quickly found herself in a leadership role for the ever-growing team of five detail oriented front office staffers. 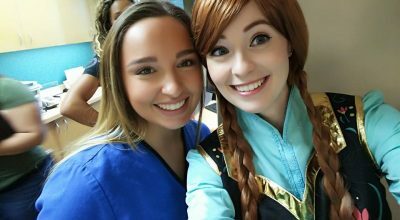 She credits Pediatric Dentistry of Fort Myers for allowing her the opportunity to develop leadership, customer service, and billing expertise. Look no further than Orlando Business Journal’s 2016 Rising 50’s: Anna Bond, Chief Executive Officer (CEO) for Rifle Paper Co., someone Ms. Harrington admires as a model of success. The stationary and gift brand is represented in over 4,000 stores around the world. Crystal owns an Etsy shop where she sells her own original acrylic paintings. She always had a taste for the arts employed at an art studio before joining the practice. She would have loved to see the completion of the Taj Mahal especially with her boyfriend Brian. The biggest enjoyment of her day comes when a parent provides positive remarks regarding their child’s experience while at the practice. Within the last three years Dr. Verwest and the staff of Pediatric Dentistry of Fort Myers has received over 1,200 reviews of 4.8 or higher on websites such as, Healthgrades, Google and Facebook. “Kindness goes a long way,” Crystal says in regards to the quality of patient care and responsibility of each family as if it was their own. Next time your visiting this pediatric dentist practice ask Crystal about her day, perhaps even the Etsy shop, or her dream of someday riding a dirt bike.